This picture from my 8th grade dance turned up on Facebook yesterday via a friend from grade school. I’m the short kid on the left. This is circa 1989 or so. I’m 90% sure that tie I’m wearing is a clip-on. You could barely make me wear pants instead of shorts at that age so a real tie would have been right out. 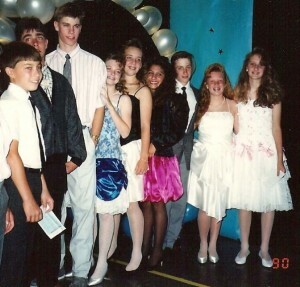 The tall kid in the back, Matt, could pretty much dunk a basketball in the 7th grade. Our junior high team did pretty well as a result because he could just keep shooting and rebounding until the ball went in. @Scott – I really hope you’re the one rocking out, because that kid is SWEET.